Basic maintenance: Keep your tow vehicle’s engine tuned and replace the engine air filter on a periodic basis. Drive ahead: Moderate your use of the accelerator pedal by “driving ahead” – by looking ahead and anticipating traffic, you will likely brake less aggressively and reaccelerate without having to be heavy on the fuel-hungry accelerator pedal. Take it easy when starting from a dead stop. Stop “cruising”: With automatic transmissions, stay off the cruise control, especially when traveling in hills or mountains. Cruise control cannot anticipate going up or down a slope, and tends to use more fuel when the transmission kicks down to a lower gear to compensate for speed loss on a hill. Tire tip: Keep tires properly inflated to the recommended PSI on both the tow vehicle and trailer. Check PSI before every trip. Cover up: On long trips, use a tight-fitting boat cover when towing, this helps decrease wind drag and improves fuel economy. Lighten up: Lighten the load by carrying just what you need for the day or weekend in the tow vehicle and onboard your boat. Also, at about six pounds per gallon of gas, try to keep the boat’s fuel tank near empty when trailering long distances. Drain it: Never leave water in a live well or bait tank. At a little over eight pounds per gallon, carrying an extra 25 gallons of water in these built-in tanks can represent 10% of the boat’s total weight. Filled wakeboard boat ballast tanks or bags can also add significantly more weight – from several hundred to over 1,000 pounds of water. Emptying tanks also slows the spread of invasive species. Slow down: A decrease in towing speed of just five or six miles-per-hour can lead to a noticeable decrease in fuel consumption. Trailer tires have a maximum speed of 65 mph, so going over that will not only harm MPG, but could damage tires as well. Prepare for the worst: Ensure you have the BoatUS Trailering Club’s “Trailer Assist”. If you have a breakdown it will tow both a tow vehicle and boat trailer up to 100 miles to a repair facility of your choice or get you home. Go local: Plan more trips closer to home this summer. Less than a month into the 2011 hurricane season, forecasters say Tropical Storm Arlene that has formed in the Gulf of Mexico is not likely to threaten the U.S. coast. The National Hurricane Center in Miami, FL, says Arlene is about 280 miles east-southeast of Tampico, Mexico. The center had maximum sustained winds of 40 mph. As promised, when we announced the arrival of the 2011 season, as the hurricane season develops we will keep you informed of things that you need to know to take care of your particular situation including preparation checklists and specific preparation procedures. How Do You Spell Pitch-Pole? According to Merriam-Webster – It is spelled Pitchpole and, when used as an intransitive verb means: to turn end over end e.g. <the catamarand pitchpoled>. It appears that is what happened last week on San Francisco Bay when America’s Cup sailboat AC45 tumbled across the Bay and made a splash on the evening news. The San Francisco Examiner was on the scene and reported that the two AC45s (45-foot catamarans owned by Oracle Racing) were running practice races at the Golden Gate Yacht Club, and that one of the boats tipped over as the vessels jockeyed for position to begin a race. “Tipped over” sounds mild compared to what is visible in the video below. Obviously there will be design challenges that this type of boat faces in trying to balance performance with stability. Imagine how messy it might get when the even larger AC72 yachts race for the America’s Cup in San Francisco in 2013. And away we go again! This weekend not only did I witness some USCG rescue exercises but also watched the movie “The Perfect Storm.” Although the movie may not be an entirely accurate account of what really happened, one can appreciate the dangers that the USCG deals with daily to rescue troubled boaters even when they (the boaters) make the WRONG decisions. The men and women in the US Coast Guard do amazing work to keep us all safer, whether that’s during disasters like Katrina or in local waters nationwide. One only needs to take a look at our BoatSafe Blog, where we publish many articles that were generated by the USCG to see how much boaters rely on the Guard. It is fitting to pause once and awhile and acknowledge their work, and perhaps even give something back. The Coast Guard Foundation website has a calendar of events, USCG news and links that you might find interesting. The following is a fitting Coast Guard Video Tribute that was used earlier this year at a Coast Guard Foundation gala. It is very moving stuff. Don’t let your weekend end up like this. The thrill of gliding across open water while steering a boat loaded with family and friends on a summer day is one of those “memory making” afternoons that can be remembered for years. If you remember that is! Recreational boating is more fun, and a lot safer, with a clear head. The start of the summer boating season is a good time to remind everyone who enjoys serving at the helm to remember vision, balance and a clear mind are important to the safety of their passengers and crew as well as everyone else on the water. As a gentle reminder, authorities across the country are participating in a national public education and enforcement campaign called Operation Dry Water the weekend of June 24 – 26 on waters open to boaters across the country. Boaters will see more officers on duty sharing information about the dangers of operating under the influence of alcohol while also arresting those undermining public safety on the water by operating while legally intoxicated. Started in 2009 by the National Association of State Boating Law Administrators in partnership with the U.S. Coast Guard, Operation Dry Water seeks to heighten water enthusiasts’ awareness about the dangers of boating while intoxicated with extra patrols during the public education and enforcement weekend. Boating under the influence is a primary contributing factor in nearly 1 in 5 boating fatalities nationwide, according to the National Association of State Boating Law Administrators. Recreational boaters need to be safe and enjoy themselves. That means not boating under the influence. It’s just too dangerous. Boaters found operating a boat with a blood alcohol content of .08 percent or higher will have their excursion ended. Staying sober is vital to staying — and playing — safe. The best way to introduce your pet to boating is to spend some time together on the boat when it’s tied to the dock. Some animals have an innate fear of the water and will never be comfortable on a boat. If your pet trembles at the site of water, you may have to leave him or her home when you go boating. However, if your pet seems comfortable on the boat when secured at the dock, the sound of the engines may drive them nuts. Before leaving the dock, test this by running the engines. Animals hear a wider range of sounds than humans do and may be more sensitive to engine noises than you are. If all goes well, plan a short cruise to introduce your pet to the motion of a boat underway. Pets can get seasick, just as humans do. Be alert for any signs of fatigue, clumsiness or disorientation. 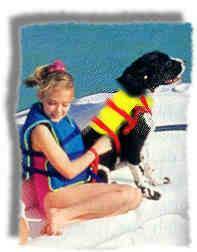 Once onboard, make sure your pet has his or her own life jacket. These are available from marine stores and pet stores located in boating areas. Even if your pet can swim, a sudden dunk in the water may be so frightening or unexpected that your pet panics. Always have a leash onboard in case you need to restrain your pet. Our dog loves the water and boating, but he becomes an attack dog if pelicans land nearby. You never know what new experiences you and your pet will encounter on the water – be on the safe side. Make sure there are no hazardous or dangerous materials within your curious pet’s reach. Nosy pets in the fishing tackle spell disaster! In a pet store, try to find a visor or brimmed cap to protect your pet’s eyes from the bright sunlight – if your pet will wear it. Always make sure your pet has a shady place on the boat to escape the sun and heat and plenty of fresh water from home for the entire cruise. Cats and dogs absorb heat through their feet, also – protect them from hot deck surfaces. Dogs and cats do not sweat – panting is the major means of getting rid excess heat for dogs and cats. However, with the heat also goes the water from the moistened exhaled air. This is why extra water is needed. Excessive panting and drooling, and abnormally rapid pulse, are danger signals that your pet may be suffering from heat stroke. Immediate treatment, in the form of immersing your animal in water, is recommended by the ASPCA. Using a little common sense, you and your pet can have a great time boating. I recently read a story about a scuba diving dog – who knows what new talents you may discover in your pet. Remember, if you plan to venture to foreign ports with your pet onboard, check the regulations in advance. Many countries have quarantine/health laws that apply to “foreign” animals. Local, state and federal law enforcement marine units as well as sheriff’s offices will be partnering in the BUI enforcement and education campaign beginning Friday, June 24 and continuing through June 26 known as Operation Dry Water. Operation Dry Water, June 24-26, 2011, is a national weekend of Boating Under the Influence (BUI) education and enforcement aimed at reducing alcohol and drug-related accidents and fatalities. Held each year during the weekend before the 4th of July holiday, Operation Dry Water is coordinated by the National Association of State Boating Law Administrators (NASBLA) in partnership with the states, the U.S. Coast Guard and other partner organizations. Since 2009, the enforcement operations has been held in June, just prior to the 4th of July holiday, aimed at reducing the number of alcohol and drug-related accidents and fatalities and fostering a stronger and more visible deterrent to alcohol and drug use on the water. According to the most recent U.S. Coast Guard statistics, boating under the influence is still the leading contributing factor in fatal boating accidents, with 16 percent of boating fatalities as a direct result of alcohol or drug use. A boat operator or passenger with a blood alcohol concentration above the legal limit (.08) runs a significantly increased risk of being involved in a boating accident. Passengers need to be wary, too. Intoxication can lead to slips, falls overboard and other dangerous accidents. It’s also important to realize alcohol consumption can result in an inner ear disturbance which can make it impossible for a person suddenly immersed in water to distinguish up from down. In 2010, all 50 States and 6 U.S. Territories participated in Operation Dry Water. Over that three-day weekend there were 40,127 vessels and 66,472 boaters contacted by law enforcement, 322 BUI arrests made, and 4,171 citations and 7,522 warnings issued for safety violations. Citizens can help by letting law enforcement know if they observe careless boat operators and by their compliance with the rules of the water. If you see careless or reckless boat operators dial 911 on your cell phone or via radio on the VHF Channel 16 to report the event. Boating Under the Influence (BUI) is dangerous and illegal. BUI is the leading contributing factor in fatal boating accidents. Learn more about the effects of BUI. Penalties can include fine, imprisonment, impoundment of your boat, loss of boating privileges and even loss of driving privileges.